First, lay out the area of the patio. Dig it out to 6″ below the finished grade. Use 1″x6″ boards to line the shape of the concrete slab. Secure the boards with stakes driven into the ground on the outside and nail the boards to the stakes (see Figure 1). If the area has curves, use heavy masonite strips. 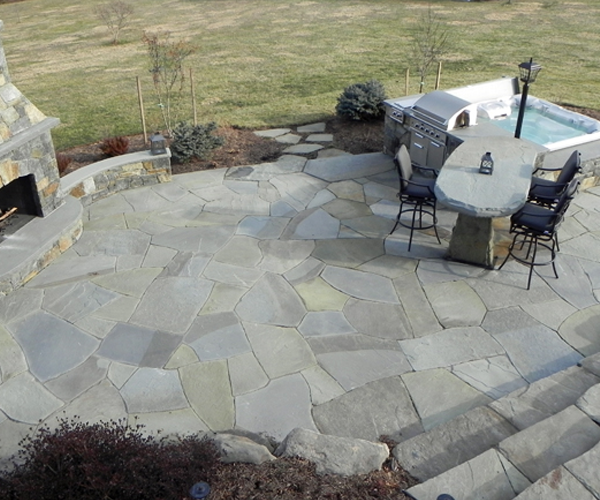 Make sure the finished grade of the patio slopes away from the house (slope 2″ in 10′). Lay in 6″x6″ concrete wire mesh. Overlap the joints and secure with wire. Place a few grade stakes 2″ below the outline board. Do this by stretching a string across the area from board to board. Then, drive in stakes 2″ below the top, this will tell you where the top of the concrete base will be, also mark boards 2″ from top. Next, pour in the ready mix concrete from a ready mix concrete company (order 6 bag mix). Start at one side of area and work toward the other side. Pour concrete to the mark on the outline boards and to the top of the grade stakes (see Figure 2). Use a garden rake to level concrete, this will give you a rough surface which is better for your setting bed for the flagstone to stick to. As you pour the concrete, pull the 6″x6″ concrete wire mesh up into the concrete or place small pieces of flagstone under the concrete wire mesh prior to pouring so the wire mesh is approximately 2″ off the ground. (Do not pour concrete if it is to soupy, it should be fairly stiff but workable). Now the top of the concrete slab is 2″ below the finished grade and ready to lay flagstone. You may start laying stone as soon as the concrete is hard enough to walk on. Start in one corner. Lay out 5 or 6 stones where you want them. Mix enough cement to lay these stones. Wash all stones to make sure all quarry dust is off. Mix Portland cement and concrete sand to a fairly stiff consistency (2 sand to 1 cement). Spread out enough cement, approximately 1″ deep to set one stone. Tap the stone into the cement with a rubber mallet or heavy hammer and block of wood. Use a straight edge across the top of the stone and across the top of the outline boards. If the stone is too low, lift up the stone and add more cement. Also look at the bottom of the stone. You will see a pattern of dampness on the bottom, that will tell you if and when you need more or less cement under the stone. Add or take away cement then replace the stone into the cement and tap down to grade. When you are satisfied that the stone is in the proper position, once more lift up the stone and make sure it is damp all over. Mix up some pure cement with water to a creamy consistency and brush liberally on the bottom of the stone, replacing the stone in the cement and tap down. Once the stone is in place, do not disturb this stone. Move on to the next stone and repeat the process until the patio is finished. Use a pointed trowel and keep the space between the stones free of cement. (This will be filled in later.) Use a short (3 foot) 2x4 straight edge for close areas and a longer (8 foot) 2x4 straight edge for large areas. Do not walk on the stones or disturb them for 24 hours or more. Keep a sponge and clean water handy and keep all of the stones clean as you set them. This will save many hours of cleaning later. After all stones are set, them you are ready to fill in the joints between them. Mix up a soupy mixture of 1 part Portland cement and 1 part sand. Using a grout bag, fill in the space between the stones slightly above the stones. Be careful not to get grout on surface of the stone. When you have used up one full grout bag, use a slicker or narrow trowel to press the cement between the stones. Scrape off any excess cement and sponge the stones clean. Move on to the next area. Once you have finished grouting all of the stones and as soon as the cement is hard enough, wash down the area by using a stiff brush or even a wire brush and plenty of water. All the square cut stones are cut to allow for a 1/2″ joint. Irregularly shaped stones should have a minimum of 1/2″ joint. However, the closer you fit irregularly shaped stones, the more cutting and fitting you will have to do. If the sun is hot, keep the concrete slab damp with a spray mist. So it will not draw the moisture out of the cement to fast. If you can shade the area you are working, it would be better. One yard of concrete will cover 80 square feet 4″ thick. We do not recommend this process to someone who is not familiar with working with cement. Use expansion joints when pouring next to house or other existing concrete. See our other sheet on “How to Lay Flagstones in Stone Dust or Sand”.